bl.uk > Online Gallery Home	> Online exhibitions	> Asia, Pacific and Africa Collections	> Beijnath Temple, Kulu Valley. 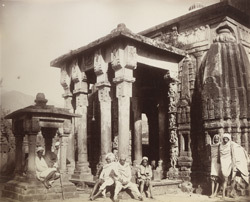 Photograph of the Beijnath Temple in the Kulu Valley from the 'Bellew Collection: Photograph album of Surgeon-General Henry Walter Bellew' by a photographer with the initials H.B.C. dating from c.1870.